‘It’s a camp kitchen multi-tool’. Packing light is the name of the game when you visit the great outdoors. Carrying a big pot to boil water is a challenge. But the Jompy lets you leave that pot at home—it heats water directly from a jug. 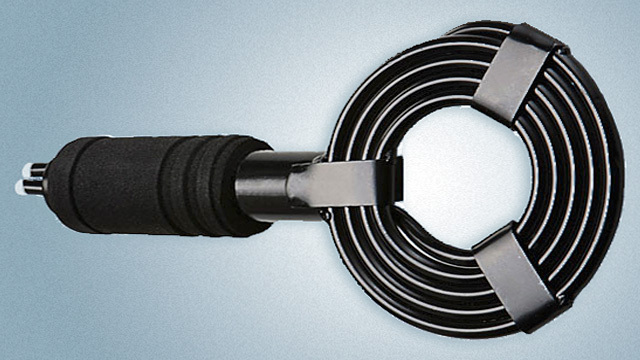 It’s hollow aluminum tubing, coiled into a disk, with two inlets leading from the coil. You simply fasten tubing to an inlet, connect one end of the coil to your water bottle or hydration bladder, and then position the aluminum tube coil over a roaring fire or hot stove. Water passes through the coil and exits a second tube, the end of which can spout hot water into a dehydrated food pouch, a dishwashing basin, or an outdoor shower. The coiled design means there’s far more surface area to absorb the fire’s heat, allowing the largest version of the Jompy to boil a liter of water in as little as 45 seconds. It also transmits heat from the fire below, so you can place a pan on top and cook at the same time. It’s a camp kitchen multi-tool, and the designers also see it as a way to reduce disease risk in areas without access to clean water. It’s a bit perverse that there are parallels between camping—a recreational activity for folk from wealthy nations—and the daily life of those living in developing nations. The upshot is that designers of camping gear have the potential to enrich the lives of millions of people living without first-world infrastructure. The Jompy portable water heater is a good example of this. 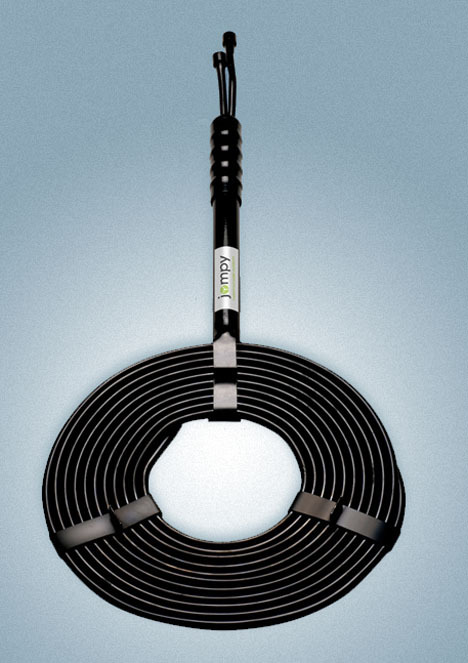 Developed by Scottish inventor David Osborne, the Jompy consists of lightweight metal tubing that has been bent into a flat coil, with the ends joined together side-by-side, resembling a frying pan shape. The user attaches a water source to one end of the tubing—in a camping situation, this could even be a water bladder–and the water then flows through the coil before exiting from the remaining end of the tubing. This allows the user to maximize the value of heat: If they light a fire or burn any type of fuel, the Jompy can be placed over it. Water flowing through it begins to rapidly boil, heating the coil up, which allows it to be used like a stovetop burner for cooking. And most importantly, that water is purified in the process. The hot water exiting the Jompy can be used for bathing, food washing, additional cooking tasks or laundry, or simply allowed to cool and used for drinking water. The Jompy comes in three different sizes, and Osborne is hip to the fact that it can help more people than campers—in fact, the developing-nation use was the prime motivator, with the camping market intended to prop them up.